The desire to race, they say, comes at an early age. Sometimes parents of boys -- and girls -- recognize the enthusiasm for things that go fast and nurture it. It's also true that some parents do all they can to discourage their offspring, telling them racing is a rough, tough, dangerous business that more times than not leads to nothing much at all. Even if his parents, Ralph and Martha Earnhardt, had tried to dissuade their son, Ralph Dale, from driving fast cars, they never would have succeeded. The odds were stacked against them. After all, Dale, as he was called, was born into racing. He was right in the middle of it from the time he was still in diapers and could barely distinguish shapes and colors. That's because father Ralph made his living as a race car driver. And he was good. Damn good. But the father knew what sacrifices he had to make to be good. There were long, tedious hours in his shop behind the house on Sedan Ave. in Kannapolis, N.C. There was a considerable amount of money spent. There was much time away from home and the needs of his family. And there was, always, the chance of injury -- or worse -- on the bump-and-grind bull rings of the Southeast on which he made his living. If his son could find another, less strenuous and more rewarding way to make a living, Ralph would do all he could to encourage him to do so. All Dale wanted to do was race. Realizing this, Ralph decided his son would learn the sport from the lug nuts up. He put him to work in the shop, performing mundane tasks at first and then advancing to more sophisticated chores that helped make Ralph's dirt-track cars among the best in the business. Dale watched his father drive -- and learned. He saw that Ralph Earnhardt was an aggressive, no-quarter driver who knew every trick in the book. He had to, if he wanted to be successful. He was competing against men who drove just like him. They had names like Junior Johnson and Curtis Turner. Dale saw them all. And he figured that if he was going to be a success on the track some day, he would have to drive just like them. On the day he announced he was quitting high school to pursue a career as a race car driver, success was a long way off. A long way. But when it came, it was so bountiful that the name Dale Earnhardt is now known to people whose knowledge of stock car racing is otherwise nil. He is touted by the national media. Products bearing his likeness and name sell in the millions of dollars. He has won as many NASCAR Winston Cup Series championships as the venerated Richard Petty -- seven, the NASCAR record. He has earned more money than any other driver in NASCAR history. He is also known by other names -- "The Intimidator," "The Dominator," the "Man in Black" -- all representative of the driving style he adopted from his father. It is a style not everyone likes and it has, from time to time, brought him punishment from NASCAR. Nevertheless, he has been nothing less than Dale Earnhardt, a driver many say might just be the best who has ever turned a wheel in NASCAR. Ralph, who died of a heart attack while working on his car in 1973, would be proud. Born on April 29, 1951, Earnhardt spent his childhood in Kannapolis as about as routinely as a boy could with a father who was a professional race car driver. By the time he quit school, Earnhardt knew what he wanted to do. He has acknowledged several times over the years that dropping out of school was "a damn fool thing to do," and it did disappoint Ralph, who wanted his son to graduate. But once it was evident Dale was headed down a path toward a professional driving career, Ralph did his best to support his son. "Dad knew that driving skill came naturally," Earnhardt said. "So he would make me aware of my mistakes and try to guide me in the right direction. He wanted me to take a good look at things and be open-minded. "He had his influence. He gave me the positive attitude. He guided me and set the stage for the kind of driver I am." Earnhardt was "18 or 19" when he ran his first race at the Metrolina Fairgrounds in Charlotte midway through the 1970 season. He finished 10th. The next year, he won his first race and eventually won 26 while racing at Metrolina and Concord Motor Speedway. He banged up some cars, but he knew how to fix them. Ralph's education paid off. During the years that passed from the time he quit school -- in the ninth grade -- until he started driving at Metrolina, Earnhardt worked in several occupations. He worked for an insulation company in Greensboro, N.C., and traveled all over North Carolina doing work. He later went to work for Great Dane Trucking in Charlotte, where he was a welder and did brake jobs. When he turned 18, he married for the first time. Still a teen-ager, he was a married man, working, racing and living in Kannapolis. "I don't recommend it," Earnhardt said. After his father's death, which greatly affected him, Earnhardt decided to pursue racing full time. He quit his job and with the help of a good friend, Gray London, and his brothers, Earnhardt purchased an asphalt-track car from Harry Gant and continued to compete at Metrolina, which by 1974 had been paved under the guidance of its new owner, Ned Jarrett. "I started racing full time and that's when I started starving to death," Earnhardt said. He was married for the second time by now. "It was tough," Earnhardt said. "Money was tight, racing was hard. All the time, you had to keep going after it. "We lived in several different places. We rented a house trailer here and there and had an apartment here and there. Finally, we bought a trailer and set it up beside the shop behind my mother's house, where I kept the race car." The year 1974 is noted as the first year Earnhardt took to the asphalt tracks. It has also been recorded as one of the hardest years of Earnhardt's adult life. "I wasn't working," he said. "We weren't making any money so I had to take a job working all through Christmas in a paper mill in New Bern, N.C., The mill was going to be down all through the holidays and the boilermakers' union was going to make repairs on the bins and things that processed the pulpwood. "I went to work as a welder for eight straight days, right through Christmas. We got time-and-a-half for that sort of thing. I wasn't home for Christmas, but I had to do it. There wasn't anything but a can of beans on the shelf back home, if that much. We lived from day-to-day. "I did have a lot of friends who helped us out. Some of them even bought us groceries." Once he got through 1974, things began to get better. Earnhardt was a more productive race driver and found the means to support his family, even if they all lived in a trailer beside the shop. But in 1977, Earnhardt divorced for the second time. He was the father of three children. The first, Kerry, by his first wife and the other two, Kelley and Dale Jr., by his second. In 1978, Earnhardt met Teresa Houston, the niece of noted Late Model Sportsman driver Tommy Houston of Hickory, N.C. Teresa was, and is, a tremendously positive influence on Earnhardt, reshaping his thinking about money, which she began to manage, his attitudes and, in general, his outlook on life. They soon began living together. By this time, Earnhardt was an established racer. He can't remember how many races a year he entered, but he was always on the go. He'd travel from Savannah, Ga., to Coeburn, Va., to Hickory. He did most of the work on his cars himself, but he did receive assistance from friends. "I did race in a Winston Cup event, the World 600 at Charlotte, in Ed Negre's car in 1975," Earnhardt said. "Then I drove a car for Johnny Ray at Atlanta in 1976 and tore it all to hell. And later, I ran in some races for Will Cronkrite. But late in 1978, I was buying used parts from Rod Osterlund (who fielded a NASCAR Winston Cup Series team with driver Dave Marcis) and DiGard and just about anyone else who would sell them to me. "Some people began saying nice things about me to Roland Wlodyka, who was Osterlund's racing boss." It evolved that Earnhardt and Osterlund starting talking about fielding a second team in 1979. Osterlund wanted Earnhardt to drive in the NASCAR Winston Cup Series race in November of 1978, but if he did that, he would have six starts for the year and would thus be ineligible for the rookie of the year title. "I was going to run Will's car in Charlotte in October, a car that broke a spindle during practice and I crashed," Earnhardt said. "It was real bad. We worked like hell to fix it, but it wasn't in good shape to run competitively in the race." To solve the Charlotte-Atlanta dilemma, Earnhardt solicited the services of journeyman Baxter Price to start the Cronkrite car at Charlotte. Earnhardt drove some and then Price got back into the car, which eventually retired with a blown engine. That finished, Earnhardt was able to drive Osterlund's car at Atlanta and still retain rookie status for 1979. He finished fourth. "We would have done better if we hadn't had an air line to bust in the pits," Earnhardt said. The idea of a two-car Osterlund operation vanished when Marcis quit the team. Earnhardt was selected to be his replacement. After maybe 10-12 races on the NASCAR Winston Cup Series since 1975, Earnhardt was going to be a full-time competitor with a top-notch team. NASCAR would never be the same. In 1979, Earnhardt was a skinny, mustachioed, 28-year-old with superb, raw driving talent and excellent assistance in the shop and the pits. Surrounded by such men as Osterlund, who became something of a father figure, Wlodyka, veteran crew chief Jake Elder, the mechanically skilled youngster Doug Richert, Eddie Jones and others, Earnhardt raced, and won, against the best. His style paid off. He wasn't a rookie who showed disrespect to his elders on the track, but he wasn't afraid of them, either. In just his 16th start on the circuit, he became a winner. On the tough, demanding half-mile track at Bristol, Tenn., Earnhardt won the Southeastern 500. He went on to post 10 more finishes among the top-five and 16 among the top-10. He was the runaway NASCAR Winston Cup Rookie of the Year. "That first year in Winston Cup racing was ideal for me," Earnhardt said. "I couldn't believe it. Before the season started, I would walk through Osterlund's shop and see all those cars being prepared for Dale Earnhardt. It was a trip. "We all got together and made it work. We did the best we could with it and we made it work. It's amazing that we could do that." There were some drawbacks, however. Earnhardt suffered severe injuries in a race at Pocono and missed four races. He quickly learned he was mortal, after all. By the end of the year, though, Earnhardt was no longer a man whose family had nothing but a can of beans on the shelf. "I never had a lot of money to worry about or invest and Rod tried to help me do that," Earnhardt said. "He wanted me to invest wisely and things like that. None of it worked out then, but I had a regular paycheck with my salary and other things. It was a much better situation." He had long since left the trailer beside the shop in Kannapolis. He and Teresa moved into a house in Doolie, N.C., on the shores of Lake Norman. "After we got going in 1979, Rod and I started talking about the championship in 1980," Earnhardt said. "Even missing four races in 1979, I still finished seventh in points. I felt good about that. The car was competitive and finished races. If we could do that again in 1980, we had a real good shot at the championship." Earnhardt had a stellar 1980 season. He won five races, finished among the top-five 14 more times and compiled 23 finishes among the top-10. And he won the NASCAR Winston Cup Series championship over Cale Yarborough, becoming the first -- and only -- driver to win the rookie and NASCAR Winston Cup titles in successive years. "We were lucky, but a lot of times you make your own luck," Earnhardt said. "We didn't stroke. If the car could go to the front, we went to the front. If it couldn't, we didn't. I trusted my instincts. I never thought about backing off, well, I did because I didn't want to run over people. "We went all out. We went as hard as we could go. Everyone was positive and pumped up. And it paid off." Earnhardt looked forward to the 1981 season. He was now an established, successful driver. And the Osterlund team had acquired a new sponsor, Wrangler, which ultimately provided some fresh, effective promotions. Earnhardt had become "One Tough Customer." But 1981 was, for Earnhardt, a bleak, discouraging year. "When we went to the NASCAR Winston Cup Awards Banquet in Daytona in 1981, Rod didn't show," Earnhardt said. "I had a bad feeling then. We won the championship and he didn't come to the banquet. I had a bad feeling." The vibes heralded the truth. After just 16 races, Osterlund was out. He sold the team to J.D. Stacy, a free-spender who had lent his name and money to as many as seven NASCAR Winston Cup teams at one time. Earnhardt felt betrayed by Osterlund. Osterlund had never discussed the sale with him and the sudden news was devastating. And he had no use for Stacy. "It happened in July," Earnhardt said. "I thought Rod and I had a pretty good relationship. I was always pretty honest with him and he was pretty honest with me. Or so I thought. "He was a big businessman and he owned the operation and people worked for him. I reckon it was just like owning one of his construction crews and laying 'em off or closing the business. "But me and the guys on the team, we felt close to Rod. We worked for his team, we raced his cars. We won together and lost together. And when it happened ... it hurt." Earnhardt raced in four events for Stacy, and then quit at Talladega in the summer. His agreement with Osterlund had been verbal, so he wasn't bound by any contract to complete the season with the new owner. Before he quit, things had been set into motion. Wrangler, not wishing to be associated with Stacy, had entered into negotiations with veteran driver Richard Childress. The offer was for Childress, who owned his own team, to relinquish the driver's seat and give it over to Earnhardt for the remainder of the season. In return, Wrangler would provide Childress with sponsorship, the type he had never had. Childress realized it was a gamble. At the end of 1981, Wrangler and Earnhardt would be gone and he would be faced with a tough decision -- to return to driving (he had never won a race and wasn't likely to) or hope he could find another sponsor and driver and continue as solely a team owner. "We knew the direction Richard was headed," Earnhardt said. "He had plans to become a team owner only. He had a lot of good contacts and he had a lot of good equipment built up." Earnhardt drove a Childress Chevrolet in 11 races, starting on Aug. 16 at Michigan Speedway. In 1981, Earnhardt did not win a race but by season's end, he had become comfortable with Childress. "We talked about staying together in 1982, but we didn't feel there would be enough money on hand to build the team we needed. It was going to take more time," Earnhardt said. "It was something of an uncomfortable situation with me," Childress said. "Here Dale was, a champion race driver, and I'm the team owner who calls the shots. We had the ability to win races, but it was obvious I wasn't going to give him the type of equipment he needed to win." n 1982, Earnhardt and Wrangler signed on with Bud Moore, who had been a team owner for most of the years since NASCAR's founding in 1948. His shop was in Spartanburg, S.C.
Childress, meanwhile, landed Piedmont Airlines as his sponsor and Ricky Rudd as his driver. If that was fortunate for him, it was equally so for Earnhardt, as time would reveal. Earnhardt spent two seasons with Moore and won just two races. He was never entirely satisfied. While Moore had a reputation for building quality cars, they just didn't seem to hold up as well as those Earnhardt had run with Osterlund. Mechanical and engine problems were frequent. And Earnhardt was not a big Ford fan. Moore ran Fords. "What hurt Bud, me and the team during the 1982 season, for example, was the car breaking and all," Earnhardt said. "It's hard to come back after you've fallen out of say, 10 straight races." In 1984, Childress and Earnhardt reunited. Rudd, ironically, replaced Earnhardt at Moore's team. To say that the reunion was successful is a dramatic understatement. The Childress-Earnhardt association, which continues to this day, has been arguably the most successful in NASCAR history. Since 1984, it has produced 62 victories and six NASCAR Winston Cup Series championships. Junior Johnson's teams won 139 races and six titles, also, while Petty Enterprises has 198 wins and seven championships. But both of those achievements came over a much longer period than the 14 years since Childress and Earnhardt got back together. In '84, the first year of their reunion, Childress and Earnhardt won twice and piled up 22 finishes among the top-10. Earnhardt wound up fourth in the point standings. There were more victories in 1985 -- four -- but there was a drop in consistency that led to eighth place in the final point standings. Then came 1986. Earnhardt won five races, finished 22 times among the top-10 and 16 times among the top-five in 29 races. He took the lead in the point standings in early May and never relinquished it. He officially won the title on Nov. 2 when he won the Atlanta Journal 500 at Atlanta Motor Speedway, one race before the end of the season. He became the first driver to win the title before season's end since 1978, when Cale Yarborough won the championship. But it was in 1985 that Earnhardt became involved in a controversy that would intensify the belief he was a sometimes over-aggressive, impatient driver. In February at Richmond International Raceway, Earnhardt was involved in a crash with Darrell Waltrip, his closest challenger for the championship, just three laps from the conclusion of the race. He tapped Waltrip in the rear and both were sent spinning into the third-turn wall, decimating several cars behind them in the process. NASCAR responded quickly with a harsh punishment, which included a fine and probation. Earnhardt appealed, saying he never intended to hit Waltrip. Probation was removed and Earnhardt was fined $3,000. It all served to bolster Earnhardt's "mean" reputation. Certainly Waltrip did his best to promote it, suggesting that Earnhardt "had meant to kill me." "We treated that incident as professionally as we could," Earnhardt said. "We didn't call anybody names and we didn't say anything wrong because there was nothing to say. I admitted the mistake. "You get tired of hearing that 'overaggressive' stuff. They stick you with that because somebody writes it and the fans accept it and the drivers punch you with it from time to time." Over the years, Earnhardt has defended his driving style, saying he is not the type of driver who deliberately looks for trouble. Instead, he practices the style of the old school, the style that belonged to his father and the others he had seen as a youngster. Even 12 years after the Waltrip incident, years during which Earnhardt accumulated the various nicknames that sometimes made him appear the Darth Vader of motorsports, he said, "Being mean and intimidating? I've never tried to be. I've never meant to be." Despite his critics, Earnhardt's style proved to be the magnet that drew fans to him in droves. They believed he was just what a stock car driver should be -- a tough competitor who drove hard, asked no quarter and gave none. He quickly became one of the most popular drivers in NASCAR and remains so to this day. Earnhardt followed up the 1986 season with another championship in 1987. His record was stunning. He won 11 races and acquired 24 finishes among the top-10. He finished 288 points ahead of Waltrip in the final point standings. Again, Earnhardt could not escape controversy. There was the now-legendary "Pass In The Grass." The Winston is a special "all-star" race open for race winners only and held annually at Charlotte Motor Speedway. It made its debut in 1985. In 1987, the format of the race changed to include three segments -- the first of 75 laps, the second of 50 and the final a 10-lap "shootout" to the finish. It was a recipe for mayhem. Starting positions for the final segment were determined by the finishing order of the second segment. Geoff Bodine and Bill Elliott were on the front row, Tim Richmond and Earnhardt the second. When the green flag flew, Bodine took the lead and Earnhardt followed, moving to the outside of Elliott and pinching him toward the apron. Elliott's car wobbled, then clipped the rear bumper of Bodine's as it rode back up the banking. Bodine spun, taking Elliott high. Earnhardt scooted into the lead. After the caution -- caution laps did not count in the final segment -- Earnhardt led Elliott. Elliott nudged Earnhardt twice. Then, with seven laps to go, their two cars swapped sheet metal coming out of the fourth turn. Earnhardt's Chevrolet, pinched by Elliott's Ford in the dogleg at the frontstretch, angled across the racing surface. The two left wheels of Earnhardt's car then cut into the grass. Under normal circumstances, this would have created a spin. Instead, Earnhardt never lifted from the throttle and as his car mowed grass, he kept it steady and came back onto the racing surface -- still in the lead. Two laps later, after Earnhardt had carried Elliott dangerously close to the fourth-turn wall as retribution for the pinch into the grass, Elliott blew a tire and fell a lap off the pace. Earnhardt went on to beat Terry Labonte to the checkered flag. Enraged, Elliott lurked on the backstretch on the cool-down lap. As Earnhardt approached, he cut his Ford into the path of Earnhardt's Chevrolet. Smoke billowed as Earnhardt hit the brakes. Contact was made. An angry Bodine, who thought Earnhardt had spun him out at the start of the final 10 laps, also clipped Earnhardt. He later admitted he was looking for someone to hit and been informed of the wrong man. "If a man has to run over you to beat you, it's time for this stuff to stop," Elliott said. "He pulled over to let me pass, then ran me into the wall. I'd say that was done deliberately." "Elliott put me in the grass and that upset me, like it would any normal person," Earnhardt said. "So I carried him high in the third turn, but I never touched him. He shoved me into the grass. He's hot and frustrated because he didn't win and he had it won until he got into that wreck with Bodine." NASCAR, once again, got into the act. It fined Earnhardt for his treatment of Elliott on the track and it reprimanded Elliott and Bodine for their post-race transgressions. That he was able to keep his car straight and never give up any speed while he was plowing up the infield has been regarded by many as the single, most riveting on-track move made by any NASCAR driver. Of course, that's up for debate. Still, the maneuver Earnhardt made in The Winston of 1987 has been immortalized in print, film, video and even artwork. It did much to enhance his reputation as a driver. "It was never a pass in the grass," he said. "I was bumped into the grass." He says that to this day. 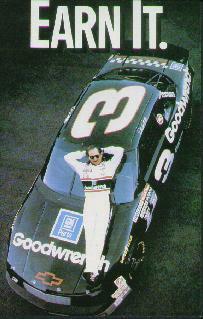 By 1988, Earnhardt's colors had changed from yellow and blue to black and silver, with the debut of GM Goodwrench as the sponsor of the Childress team. The appearance of his Chevrolet, and his reputation, eventually lent themselves to the Man in Black nickname. Earnhardt continued his dominance of NASCAR Winston Cup racing. From 1988-1994, he won 32 times and claimed a whopping four more championship. In 1990, he nipped Mark Martin by 26 points for the title. He bested Ricky Rudd in 1991. In 1993, he topped Rusty Wallace. And in 1994, he took the measure of Martin again. That was his seventh title and given the fact Earnhardt showed no signs of diminished productivity, nearly everyone thought he would have little difficulty taking an eighth championship and besting Richard Petty's record. It almost happened in 1995. Earnhardt won five races, but finished second in the point standings to an upstart named Jeff Gordon. In 1996, he finished third in points, behind champion Labonte. And in 1997, he was fifth, well behind Gordon, the champ for a second time. It was during these two seasons that some began to suspect a chink in Earnhardt's armor. Although he won twice in 1996, he was involved in a vicious crash in the DieHard 500 at Talladega Superspeedway on July 28 that chilled his season. On lap 117 of a race shortened to 129 laps because of rain, Earnhardt was leading. Sterling Marlin was on his right rear flank and Ernie Irvan on his rear bumper. Contact between the right front of Irvan's Ford and Marlin's Chevrolet turned Marlin to the left, and his front clipped Earnhardt's right rear as the three cars hurtled toward the start/finish line. Earnhardt's Chevrolet slammed the outside wall and tumbled over at least once after it bounced off the wall. Nine other cars were caught up in the accident. Earnhardt emerged from his mangled car and walked to the ambulance. His right arm was across his chest, his hand gripping his left shoulder. He grimaced in pain. Earnhardt sustained a broken sternum, a broken left collarbone and a bruised pelvis. At the next race, the Brickyard 400 at Indianapolis Motor Speedway which he had won a year earlier, Earnhardt lasted just six laps before he gave up the driver's seat to relief driver Mike Skinner. Confronted by television cameras, Earnhardt, for the first time anyone could remember, let emotions spill. He choked up as he said, "It was hard to get out of that car ... I mean ... you know, it's my life right here." Earnhardt never let up. He got back in the Childress Chevrolet for the next race at Watkins Glen. He won the pole and finished sixth. He would have a few more top-five finishes afterward, including a second at North Wilkesboro. Although no one knew it at the time, second would be as high as he would finish for all of 1997. How much Earnhardt was affected by his injuries at the close of 1996 has always been debated, but even his team owner has said that if things could have been done differently, they would have. "We would have re-evaluated the situation," Childress said. Which meant Earnhardt would not have been allowed to drive until he was completely healed. Earnhardt's health was just one piece of evidence some observers used to explain the winless 1997 season. Broken bones were one thing, but to pass out was quite another. As incredible as that might seem, that's exactly what happened to Earnhardt at the start of the Mountain Dew Southern 500 at Darlington Raceway. Earnhardt's Chevrolet wobbled around the track during the pre-race parade laps. Childress and the crew became instantly alerted. Then, as the race started, Earnhardt clipped the wall. Frantically, Childress and crew ordered him to pit. He did so and when he was removed from the car, he blacked out. Doctors were never able to find the cause. After a battery of tests over a period of days, Earnhardt was pronounced fit. Which was a relief for a concerned Earnhardt. He knew his father had died of a heart attack. "That's what concerned me most," he said. "I definitely wanted to find out what was wrong. The thought did cross my mind that I might not be able to drive again, but the major thing was life itself and spending it with people who are close to me." Earnhardt didn't miss a race in 1997, but he didn't win one, either. It was his first winless season since 1981. The critics said the end was nigh. 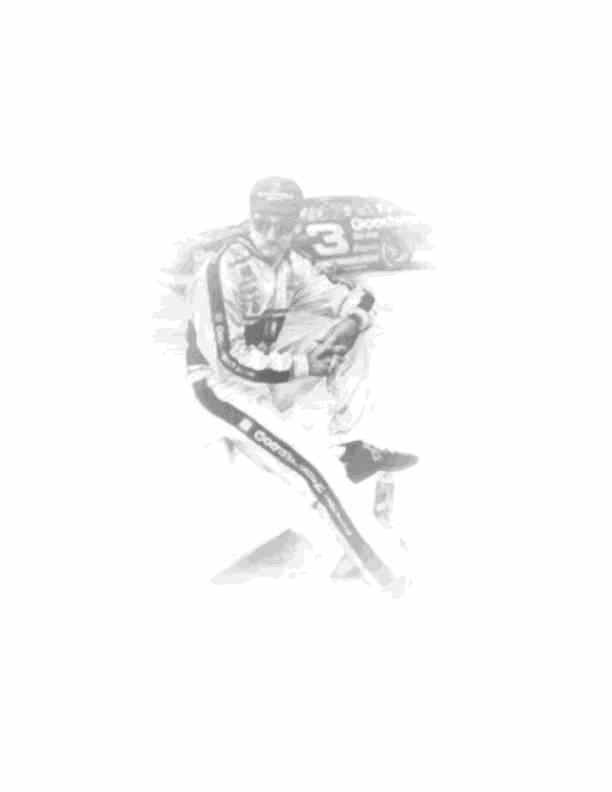 Earnhardt's health, the fact that Childress had diluted quality with the formation of a second team in 1997, Earnhardt's lost focus because of his own business interests which included NASCAR Busch Series and NASCAR Craftsman Truck Series teams and the construction of a new shop -- all of these were used as evidence The Intimidator was far less than he had been. Then came Feb. 15, 1998. Earnhardt had spent 19 previous years trying to win the Daytona 500, the crown jewel in any season. He had won 30 races at Daytona -- 125-mile qualifying races, the Pepsi 400, NASCAR Busch Series races, IROC -- but never the Daytona 500. This time, he did it. And a 59-race winless streak came to an end. As he took the checkered flag, crew members in his pit stall erupted in celebration. As he made his way down pit road toward Victory Lane, crews from every team lined up to shake his hand -- perhaps the most emotional sight in Daytona's storied history. "I wish that at some point in their lives, everyone could experience the feeling I had at Daytona," Earnhardt said. If winning the Daytona 500 isn't the highlight of Earnhardt's career, it was certainly so for the season. It was his only victory of 1998. From those bleak days when there was only a can of beans on the shelf, Earnhardt has come to a point where he can lead the type of lifestyle only few experience. He has all the creature comforts -- planes, boats, homes, a working farm. His family, which includes Taylor Nicole, his daughter by Teresa born on Dec. 20, 1988, wants for nothing. Dale Earnhardt Inc. has become a huge enterprise, which will soon unveil its new, glittering headquarters near Earnhardt's farm in Mooresville, N.C. Rookie Steve Park drove an Earnhardt-owned Chevrolet on the NASCAR Winston Cup circuit in 1998. And Dale Earnhardt Jr. won the NASCAR Busch Series championship in a family-owned Chevrolet. It was a very successful campaign, as young Earnhardt won seven races and scored 16 top-five finishes in 31 races. Many see him as the image of his father and, perhaps, the next sensation on the tour. As for the elder Earnhardt, now 20 years into a NASCAR Winston Cup career, there are no plans to back off. He will continue to race with Childress and oversee his many business enterprises. But he is mellower. Having nothing to prove on the track, all he needs materially, a huge fan base and the love of a family has created that. For recreation, he likes to hunt and fish. He'd rather hang out at the farm or his home than go to a restaurant and a movie. It's tough to do both because of the fast pace of his life. "There are always life's little problems," Earnhardt said. "But I can always look around and see worse or people who have less than I have, and I'm not talking about just material things. I feel fortunate and blessed to have what I have." That doesn't sound very intimidating, does it?